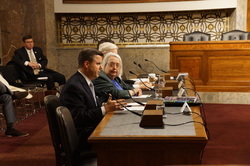 AFSA CEO Robert L. Frank testifies before the Senate Armed Services Subcommittee on Personnel Feb. 11, 2015. March 4, 2015: "We ask this Subcommittee to regard our recommendations in the spirit of understanding that there is an inextricable link between national defense, readiness, and quality-of-life programs." -- AFSA CEO Robert L. Frank, in written Congressional testimony to Senate Committee on Armed Services, Subcommittee on Personnel March 4, 2015. Read entire written testimony here.